Match 7 in the men’s category of the ongoing Africa Cup of Nations in Ismaila, Egypt was one of the toughest games in the competition so far. The Egyptians locked horns with the defending champions, South Africa in a fierce encounter at 15:00 on 26th October, 2017. The match which featured the first and second ranked men hockey teams in Africa, drew a lot of fans around Ismailia to the Suez Canal Hockey Stadium. 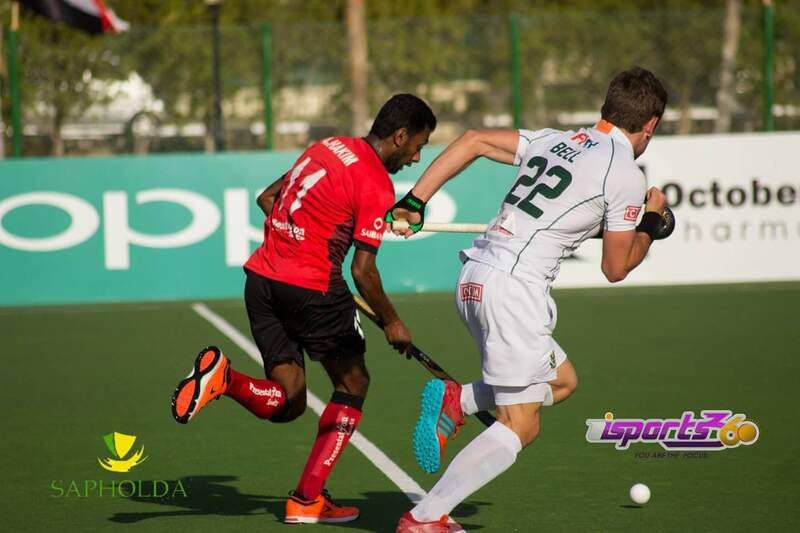 The first quarter of the match offered few chances to both sides but neither of them able to register a goal.The first goal came in the 23rd minute from Paton Taine to put South Africa in the lead. The Egyptians who tried to restore parity, found the ball in their post again 5 minutes later through Ntuli Nqobile. The Champions who had taken a comfortable lead and a foot in the final on sunday, were caught off guard when the host took an advantage of a penalty stroke to reduce the tally. The first half ended 2-1 in favour of South Africa. Egypt came back strong in the 3rd quarter and levelled the game through Ahmed Gamal in the 35th minute. ElGanainy Ahmed scored in the 41st minute to put the host in front for the first time in the game. South Africa’s skipper Tim Drummond who is determined in lifting this year’s trophy, brought the Champions back into the game in the 48th minute. With the match tied at 3-3, the final minutes of the game gave rise to tension around the stadium as the winner of this game had a higher chance of playing in Sunday’s final. The game ended 3-3 with both teams staying top of the table with 7 points and a game each to play. Team Nigeria who had lost their earlier 3 matches in this competition, took on the Blacksticks of Ghana in the last match of the day. The Nigerians surprisingly took the lead in the first 10 minutes of the 1st quarter through Fowobaje Oluwatosin. That proved to be their only goal as the Black Sticks came back very strong in the 2nd quarter and beyond. Damalie Luke started the scoring for Ghana when he equalised in the 21st minute before Ankomah Emmanuel’s 27th minute strike put Ghana in the lead heading into the first half of the game. In the last quarter, the Black Sticks continued from where they stopped as goals from Abbiw Charles, Ntiamoah Alfred and Ernest Opoku in the 45th, 46th and the 49th minutes respectively completed a resounding victory for them. The loss which was Nigeria’s fourth in as many matches meant they are out of the tournament. With last round of matches to play, Egypt are 1st with 7 points same as South Africa but a superior goal difference. Ghana who will like to break the Egypt-South Africa final jinx, lie 3rd with 6 points and a game with Egypt on Saturday. Kenya come in 4th place with Nigeria taking the 5th place spot.